Antique - Victorian Style, Hand Painted Porcelain Tea Set, 16-Pieces Service for Six, Made in the 1850's to the 1860's. This is a Very Rare Find, and in great condition, especially consider the age. 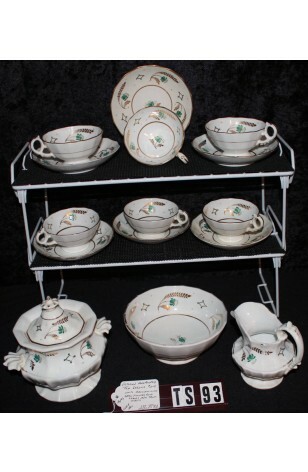 A Beautiful Hand Painted Porcelain, 16 Piece Set, Service for Six, from Circa 1850's-60's. A White Background with Green Flowers, Gold Branches. Gold and Green Diamonds on the Band inside the Cups and Waste Bowl, as well as the outside Band on Sugar Bowl, Creamer and Saucers. Quite an Old Set to have so much Gold still intact. And the Pattern is Bright, and Attention Getting.. So Rare, So Nice. This is a Very Rare Find, and in great condition, especially consider the age. A Beautiful Hand Painted Porcelain, 16 Piece Set, Service for Six, from Circa 1850's-60's. A White Background with Green Flowers, Gold Branches. Gold and Green Diamonds on the Band inside the Cups and Waste Bowl, as well as the outside Band on Sugar Bowl, Creamer and Saucers. Quite an Old Set to have so much Gold still intact. And the Pattern is Bright, and Attention Getting.. So Rare, So Nice. Good Resale Condition unless noted below or in pictures. 1 - Bowl - 3" Tall x 6 7/8" Dia - Footed, Cranberry/Candy/Waste Bowl/etc.